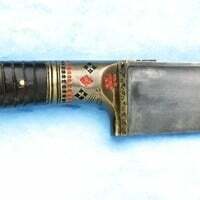 Type of Charay knife originally used in Indo-Persia but popularity quickly spread accross the near east. Famed for its use against the British by the native tribes of the Khyber Pass area. Still in use in Afganistan, Pakistan and Northern India today. 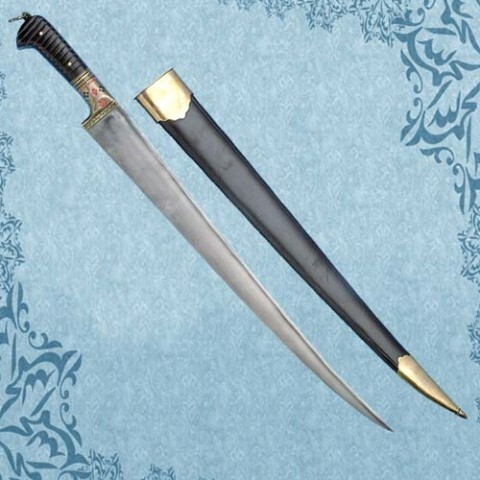 Scabbard worn thrust , unsecured in a number of positions under the belt. Aged finish on the entire knife and scabbard. Worked and pianted brass and buffalo horn grip. Full tang profile with customary ring at the end of the grip, used for a wrist tie-down. T shaped 57cm x 5cm blade with strong raised spine along the full length. Overall length 73cm. Weight 0.9kg.